I don't know about you, but my skin is PARCHED. This winter has taken such a toll on my entire body -- I've been trying everything humanly possible to restore a little moisture to my dehydrated skin. Enter Tatcha Indigo Soothing Silk Body Butter. I have to admit I was a little taken aback when I first opened the tub and saw just how blue this product really is. We're talking rich, deep indigo. I was sure it would stain my skin -- no way would it just blend right into my Casper-colored legs! Well, I was wrong. Somehow, the bold hue turned invisible once it was massaged in. And in its place? Nourished, hydrated legs without a touch of dryness anywhere! A combination of indigo, liquid silk and Squalane combine to create this skin-enriching body butter. The formula itself is rich and lush, and it blends into skin immediately upon contact. Plus, it's anti-inflammatory -- so if you're experiencing any redness or discoloration, it fades! I found that upon application, my legs no longer had that uncomfortably tight, itchy feeling that comes with extreme dryness. This body cream is also safe enough for people suffering from eczema, dermatitis and rosacea, which is a major selling point for me -- I don't have those medical conditions, but my skin is definitely on the sensitive side and reacts negatively to many products. Not so with this cream, which banished my dryness and redness almost instantly! The scent is refreshing, feminine and sultry but not too overpowering (read: it won't keep you awake at night if you apply right before bed). If you're looking for a body cream that makes dehydrated skin feel like new, this is definitely one for you to try. I know it hasn't left my nightstand (or my beauty regimen!) in over a month! 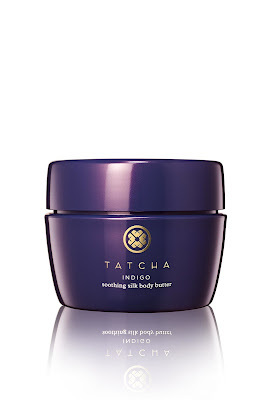 Tatcha Indigo Soothing Silk Body Butter retails for $48 at tatcha.com.